USDA-ARS, 24106 N. Bunn Rd., Prosser, WA 99350; USDA-ARS, 29603 U of I Ln., Parma, ID 83660; North Carolina State University, Department of Horticultural Science, Raleigh, NC 27695; and USDA-ARS, 3420 N.W. Orchard Ave., Corvallis, OR 97330. Using a forced convection system, temperatures of Merlot grape clusters were monitored and controlled between veraison and harvest to produce a dynamic range of berry temperatures under field conditions in both sun-exposed and shaded fruit. Ten combinations of temperature and solar radiation exposure were used to quantify effects on phenolic profiles (anthocyanins and flavonol-glycosides) and on total concentrations of skin anthocyanin (TSA) in the fruit at commercial maturity. Exposure of berries to high temperature extremes for relatively short periods during ripening appears to alter the partitioning of anthocyanins between acylated and nonacylated forms and between dihydroxylated and trihydroxylated branches of the anthocyanin biosynthetic pathway. Specifically, among flavonol-glycosides, quercetin 3-glucoside increased with exposure to solar radiation. Low incident solar radiation alone appeared not to compromise total anthocyanin accumulation; rather, a combination of low light and high berry temperatures decreased TSA. Regardless of exposure to solar radiation, higher berry temperatures led to a higher concentration and a higher proportion of TSA comprised by malvidin-based anthocyanins, driven primarily by increases in the acylated derivatives. Under shade alone and under high temperature extremes in sunlit and shaded fruit, acylated anthocyanins represented a larger proportion of TSA than did nonacylated anthocyanins. At berry temperatures equivalent to those of shaded fruit, exposure to solar radiation decreased the proportion of TSA comprised by acylated forms of the five base anthocyanins and increased the proportion of TSA comprised by dihydroxylated anthocyanins. Results indicate a complex combined effect of solar radiation and berry temperature on anthocyanin composition, synergistic at moderate berry temperatures and potentially antagonistic at high temperature extremes. Phenolics are a diverse group of secondary metabolites that have been linked to several plant functions including providing protection against UV radiation and fungal infection and facilitating seed dispersal (Gould and Lister 2006). While phenolics comprise <5% of wine constituents, they are important because of their contribution to appearance (color), taste (bitterness) or mouthfeel (astringency), and potential benefits to human health (see review by Cheynier 2005). Grapes differ in phenolic composition and concentrations based on cultivar, vineyard microclimate, and vineyard management practices (Downey et al. 2006). Grape and wine phenolics can be divided into two groups: nonflavonoids and flavonoids. Flavonoids, especially anthocyanins and proanthocyanidins, are the most commonly cited compounds linked to color quality in red wine (Cheynier 2005). There are three main groups of grape flavonoids: flavanols, anthocyanins, and flavonols. Grape proanthocyanidins, polymers of flavanols, protect wine against oxidation, stabilize wine color, and enhance the complexity of wine taste and mouthfeel (Cheynier 2005). Anthocyanins, which contribute to color, are synthesized in the skin of the berry after veraison via the phenylpropanoid biosynthetic pathway (reviewed by Downey et al. 2006). There are several anthocyanins found in grape, including cyanidin, peonidin, delphinidin, petunidin, and malvidin-derived pigments, the relative proportions of which are known to vary by cultivar. Flavonols act as a natural sun-screen in the grape berry and are important cofactors for color enhancement in grapes and wine (Ristic et al. 2007, Downey et al. 2004, Spayd et al. 2002, Haselgrove et al. 2000). They are synthesized along the same pathway as anthocyanins (Robinson and Davies 2000). Common flavonols in grape skins include quercetin, kaempferol, and myricetin, present as glycosides. There has been growing interest in defining the field conditions, especially canopy microclimate, that influence color development in grapes (Cortell et al. 2007, Downey et al. 2004, Spayd et al. 2002) and by extension, in wines. Factors that have been implicated include exposure of clusters to solar radiation, vine nutrient stress, extreme temperatures, and infection by various pathogens (Ubi et al. 2006, Yamane et al. 2006, Mori et al. 2005a, 2005b, 2007, Downey et al. 2006, Winkel-Shirley 2002, Chalker-Scott 1999). A number of studies have correlated air temperatures with anthocyanin composition and concentration, with the caveat that air temperature may not represent fruit temperature at a given time. It can be particularly difficult in the field to separate, monitor, and control the effects of individual microclimatic factors on the production of phenolic compounds. Previously we demonstrated the separate effects of solar radiation and temperature, in the field, on the concentration of individual and total skin anthocyanin (TSA) in Vitis vinifera L. cv. Merlot berries at commercial maturity (Spayd et al. 2002). Those data indicated that berry skin temperature may have more influence on TSA than does solar radiation. The objective of the current study was to control the temperature of sunlit and shaded grape clusters under field conditions during ripening. The resultant range of fruit temperatures under the two radiation regimes was used to quantify associations between fruit temperature and both the phenolic profiles (anthocyanins and flavonol-glycosides) and concentrations at commercial maturity. The study was conducted in 2001, 2002, and 2003 at the Irrigated Agriculture Research and Extension Center (IAREC) in Prosser, WA (46.30°N; 119.75°W) in a 1.2 ha vineyard planted in 1983. The experimental plot comprised four rows oriented north-south (13 vines per row) of own-rooted Vitis vinifera cv. Merlot. Vines were double-trunked, trained to a bilateral cordon at 1.2 m aboveground, and spur-pruned annually. Experimental vines were selected randomly from the two center rows of the plot. All clusters on a given cordon either were shaded or exposed to incident solar radiation by positioning the shoots to the side of the canopy that was to be shaded: shoots were brought over a “wind” wire at 1.5 m aboveground and tied to a catch wire at 1.2 m above-ground that was parallel to the cordon and wind wires. Shoot positioning occurred regularly as shoot lengths permitted. Because one layer of V. vinifera leaves will absorb 80 to 90% of incident solar radiation (Smart 1985), this natural shading technique was expected to allow only low levels of predominantly diffuse solar radiation to strike shaded clusters. Previous measurements in the same plot indicated that from veraison to harvest, in a fruiting zone shaded by this technique, incident solar radiation typically was ~50 to 100 W m−2 around midday (Spayd et al. 2002). Berry clusters were distinctly exposed or shaded from as early as fruit set onward. Fruit temperatures were controlled from about one week (2001) or three weeks (2002, 2003) before the first visible sign of veraison until harvest (Table 1⇓). Clusters (n = 3) were subjected to one of 10 combinations of temperature and solar radiation exposure (Table 2⇓), where exposure to solar radiation was classified as: (1) exposed to direct solar radiation on the east aspect of the canopy (Sun); (2) shaded from direct solar radiation on the east aspect of the canopy (Shade); and (3) exposed to direct solar radiation on the west aspect of the canopy (West-Sun). Temperature conditions were classified as: (1) nonmanipulated ambient (Sun, Shade, and West-Sun); (2) heated air blown across clusters (Shade+1, Sun+1, Sun+2); (3) cooled air blown across clusters (Sun-1, Sun-2); and (4) ambient air delivered to a cluster at the same rate as the heated and cooled air to account for the effects of heat transfer by forced convection (Sun-Blower, Shade-Blower). Dates and duration of temperature control treatments applied to Merlot clusters. Temperature-solar radiation regimens applied to clusters of Merlot and summary of actual temperatures achieved among treatments between veraison and harvest, averaged across three growing seasons. All in situ temperature control was accomplished by a feedback-controlled system that blew forced air across the clusters (Tarara et al. 2000). Delivery tubes were positioned directly below the cluster for vertically oriented airflow. Measurements of cluster temperature provided feedback to the system to control delivery of heated or cooled air at 5-sec intervals. The difference in temperature between the average of Sun clusters and the average of Shade clusters was used as the reference (ΔTr) to compute set points for heated and cooled treatments. Warm air was blown across Shade+1 clusters to maintain their temperatures at that of the average for Sun clusters (east aspect). Cool air was blown across Sun-1 clusters to maintain their temperatures at that of the average for Shade clusters (east aspect). Sun+2 clusters were heated to a target temperature 2*ΔTr degrees above the average for Sun clusters, with a high temperature threshold of 50°C. Sun+1 clusters were heated to a temperature above Sun that was one-half of the actual temperature difference achieved between Sun+2 and Sun, also with a high temperature threshold of 50°C. Sun-2 clusters were cooled to a target temperature 2*ΔTr below the average temperature of Sun clusters. Sun-1 clusters were cooled to a temperature below Sun that was one-half the actual temperature difference achieved between Sun-2 and Sun. Air was delivered to Sun-Blower clusters synchronously with the cooled air delivery to Sun-1, the reference treatment for Sun-Blower. Air was delivered to Shade-Blower synchronously with the heated air delivery to its reference treatment, Shade+1. The temperature of each experimental cluster was estimated from the average temperature of four berries distributed vertically along the cluster’s exterior face. Berry temperatures were measured with fine-wire (0.13 mm diam) thermopiles (type T [copper-constantan]) comprised of four junctions (2 mm long) wired in parallel. Each junction was inserted just beneath the skin of a berry approximately at the equator of the sphere and fixed at the insertion point with a drop of water-based household glue. After veraison, no necrosis was observed at thermocouple entry points. Ambient air temperature was measured by a shielded, aspirated, fine-wire thermocouple (0.13 mm diam; type T) in the canopy (1.2 m aboveground) and by another at a reference height of 2 m above the canopy. Global irradiance was measured by a pyranometer (model 8–48; Eppley Laboratories, Newport, RI). Irradiance at the fruiting zone was measured by 1-m long tube solarimeters (model TSL; Delta-T Devices, Cambridge, UK) mounted parallel to sun-exposed cordons on both aspects of the canopy and parallel to a shaded cordon with an east aspect. Prior to each experimental season, the tube solarimeters were mounted with a north-south orientation in a vacant field and their output normalized against the Eppley pyranometer over several days. All signals were scanned at 5 sec intervals and averaged every 12 min by a datalogger (CR-10X; Campbell Scientific, Logan, UT) that also controlled thermocouple multiplexers (AM25T; Campbell Scientific). Thermal time (degree-days [DD], base 10°C) accumulated by clusters was calculated by the trapezoidal method (Tobin et al. 2001). Mean, maximum, and minimum cluster temperatures were computed for the entire experimental period and across subsets of the data: preveraison, ripening, daytime during ripening, and nighttime during ripening. Ripening was defined as the period between the first visible sign of veraison and harvest. Day was defined as global irradiance ≥5 W m−2 and night was defined as global irradiance <5 W m−2. Durations of cluster exposure to arbitrary threshold temperatures above 15°C (HR>15), 20°C (HR>20), 25°C (HR>25), 30°C (HR>30), 35°C (HR>35), and 40°C (HR>40) were computed across the entire experimental period and across the aforementioned subsets of the data. Analysis of berries and berry skins. Fruit was harvested when the percent soluble solids (%SS) of a composite berry sample (n = 100) collected randomly from untreated clusters across the experimental vines reached ≈24 Brix. All treated clusters were harvested on the same day, collected whole, and berries were segregated immediately by location on the cluster. Each cluster was divided equally in the horizontal (top, middle, and bottom) and vertical (exposed face, shaded or interior to the canopy face) planes, with the bottom third, or cluster tip, left as a composite of both cluster faces. For each cluster, a subsample of berries from each location was stored at −40°C until analysis for phenolic compounds by HPLC. Each year, %SS, pH, and titratable acidity (TA; expressed as g tartaric acid/L) were determined on a composite sample of 100 to 175 fresh berries from all clusters in a treatment as described previously (Spayd et al. 2002). Frozen berries were removed from the freezer the day of extraction and allowed to thaw slightly to facilitate removal of the skins. Skin removal, extractions, and separation of anthocyanins and flavonol-glycosides were conducted as described previously (Spayd et al. 2002), with the following changes to the method. A Novapak C18 analytical column (300 mm × 3.9 mm, 4 μm; Waters Corporation, Milford, MA) was fitted with a guard column of the same packing material. Injection volume was 25 μL. Column temperature was maintained at 40°C by a column heater (model MetaTherm; Varian Inc., Lake Forest, CA). Eluent A was 50 mM dihydrogen ammonium phosphate (adjusted to pH 2.6 with phosphoric acid). Eluent B was 20% eluent A and 80% acetonitrile. Eluent C was 0.2 M phosphoric acid (adjusted to pH 1.5 with NaOH). The initial solvent composition was 100% eluent A for 5 min, then a linear gradient of 100% to 92% eluent A, and 0% to 8% of eluent B in 3 min; 92% to 0% of eluent A, 8% to 14% of eluent B, and 0% to 86% of eluent C in 12 min; 14% to 16.5% eluent B, and 86% to 83.5% eluent C in 5 min; 16.5% to 21.5% eluent B, and 83.5% to 78.5% eluent C in 10 min; 21.5% to 50% eluent B, and 78.5% to 50% eluent C in 35 min (total 70 min run). Detection occurred simultaneously at 520 nm (anthocyanins) and 365 nm (flavonol-glycosides). The solvent flow rate was 0.5 mL·min−1. Peak assignments were made based on retention times, UV-visible spectra, and identifications previously reported (Spayd et al. 2002). For each temperature-solar radiation treatment, concentrations of individual anthocyanins and flavonol-glycosides were averaged across locations on the cluster. Results pertaining to anthocyanins and flavonols are independent of berry size because of sample preparation technique and extraction from skin discs of known surface area. Concentrations of anthocyanins are expressed as μg of malvidin 3-glucoside (Indofine Chemical Co., Hillsborough, NJ) per cm2 berry skin. Total anthocyanin concentration was calculated as the sum of concentrations for individual anthocyanins within each cluster. Flavonol-glycosides are expressed as μg of quercetin 3-glucoside (Indofine Chemical) per cm2 berry skin. Total flavonol-glycoside concentration was calculated as the sum of concentrations for individual flavonol-glycosides within each cluster. Hereafter for conciseness, units for anthocyanins and flavonol-glycosides will not be specified after each value when mentioned in the text. Three clusters were assigned randomly to each temperature-solar radiation treatment, which were imposed during three seasons. All data were tested for homogeneity of variance using Levene’s test and for normality using the Kolmogorov–Smirnov test. Where transformation was necessary, back-transformed means and arithmetic standard errors are presented in tables. Where assumptions of normality and homogeneity of variance could not be met even after transformation, data were analyzed using Mann–Whitney U-test at p ≤ 0.05. All statistical analyses were performed using Statistica (version 8; StatSoft, Tulsa, OK). Data for average berry mass, %SS, pH, and TA were analyzed using one-way ANOVA procedures to assess the effect of year (n = 10) and treatment (n = 3) using separate models. Cluster temperature and berry skin composition data were analyzed in a complete factorial design using ANOVA procedures with year and temperature-radiation treatment as main effects (n = 3). Concentrations of phenolic compounds below the detection threshold were excluded from statistical analyses. Where indicated by ANOVA, differences in means between years were separated using Tukey’s honestly significant difference at p ≤ 0.05 (THSD0.05). The influence of specific temperature and radiation regimens on response variables across years was assessed using a priori contrasts at p ≤ 0.05. The relationship between temperature and phenolic composition in clusters exposed to direct solar radiation (Sun-2, Sun-1, Sun, Sun+1, Sun+2) was assessed using polynomial contrasts at p ≤ 0.05 (Sun-linear contrast). Best subset regression was applied to assess the effects of postveraison temperature on phenolic concentrations in these same clusters, with Mallows’ Cp as the criterion for choosing the best subset of predictor effects using the following temperature predictors: thermal time (accumulated degree days), mean and maximum cluster temperature, and HR>15, HR>20, HR>25, and HR>30. Cluster exposure to temperature and solar radiation. During ripening, similar fractions of total global irradiance impinged upon clusters exposed to direct solar radiation on the east (41 to 42%) and west (40 to 45%) aspects of the canopy (Figure 1⇓). By contrast, clusters in the shade were exposed to ≈12% of total global irradiance. Between veraison and harvest, total global irradiance was 588 MJ in 2001 (average 13.7 MJ d−1), 643 MJ in 2002 (average 14.0 MJ d−1), and 640 MJ in 2003 (average 13.9 MJ d−1). Exemplary diurnal curves on three consecutive days for global irradiance (Rs) and the irradiance impinging on the fruiting zone of the exposed east aspect of the canopy, exposed west aspect of the canopy, and fruiting zone that was shaded by the canopy. Data are DOY 238 to DOY 240, 2002. Blowing ambient air across shaded clusters did not induce appreciable convective heat transfer: berries in the Shade and Shade-Blower treatments accumulated a similar amount of thermal time and were subjected to a similar duration of exposure to temperatures above thresholds between 15 and 35°C, and incurred similar mean, minimum, and maximum berry temperatures (Table 2⇑; HR>15, HR>20, and HR>25 not shown). Consequently, differences in berry composition between Shade and its heated counterpart (Shade+1) can be considered independent of the temperature-control method. The Shade+1 berries were warmer than Shade berries, with more accumulated thermal time, longer exposure to temperatures above thresholds between 20 and 35°C, and higher mean and maximum berry temperatures (Table 2⇑; Shade vs. Shade+1; HR>20 and HR>25 not shown). Blowing ambient air across sunlit clusters did cause some convective heat transfer: berries on Sun-Blower clusters had 1.4°C lower daytime temperature and 5°C lower maximum temperature than berries on Sun clusters. These temperature differences are to be expected because ambient air delivered to Sun-Blower clusters was cooler than the clusters themselves part of the time that they were exposed to direct solar radiation. Therefore, berries on Sun-Blower clusters accumulated 7% less thermal time than those from Sun clusters, had shorter exposures to temperatures above thresholds from 25 to 40°C, and lower mean and maximum berry temperatures (Table 2⇑; Sun vs. Sun-Blower, HR>25 data not shown). However, only TA and pH differed between these treatments (data not shown). Observed differences in berry temperature between Sun and Sun-Blower clusters did not influence the concentrations of individual anthocyanins or flavonol-glycosides. Thus, among clusters exposed to direct solar radiation (Sun-2, Sun-1, Sun, Sun+1, Sun+2, West-Sun) differences in phenolic composition can be considered a result of treatment effect and do not appear to be a response to the temperature-control method itself. 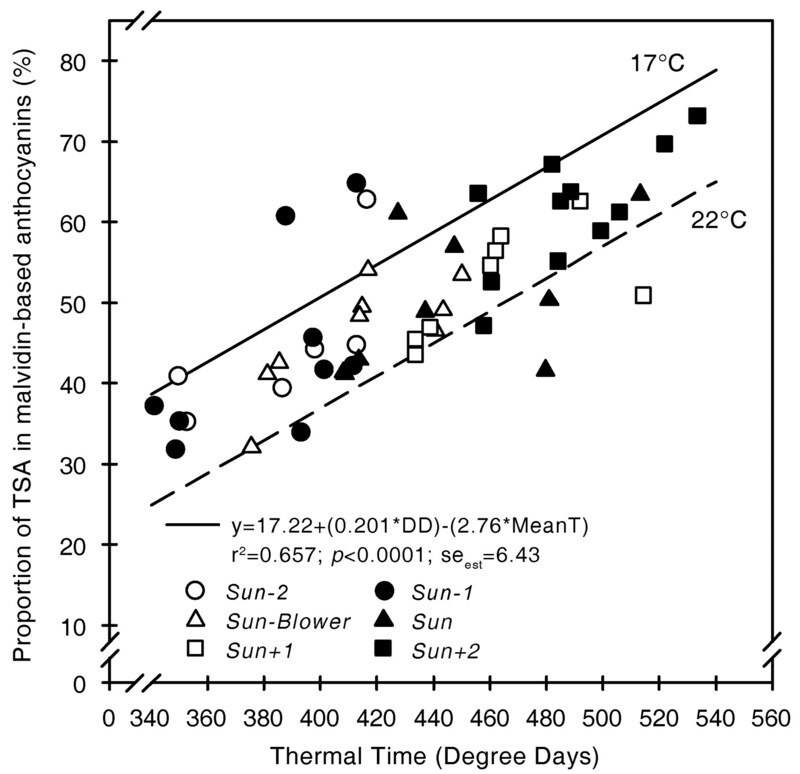 Increasing the temperature of sunlit clusters on the east aspect of the canopy (Sun-2, Sun-1, Sun, Sun+1, Sun+2) led to increased accumulated thermal time, higher mean and maximum berry temperatures, and longer durations of exposure to temperatures above thresholds from 20 to 40°C (Table 2⇑; Sun-linear contrasts, HR>20 and HR>25 data not shown). Consequently, differences in berry composition among these clusters can be considered a result of the linear effect of treatment on berry temperature. In general, temperature trends among treatments for the entire experimental period were similar to trends in all subsets of the data that were examined (preveraison, postveraison, daytime only, and by year). Berries on Sun clusters were subjected to a similar amount of thermal time and similar mean temperatures as Shade+1 clusters; however, during ripening, berries on Sun clusters were subjected to higher maximum temperatures and longer exposure to temperatures above thresholds from 35 to 40°C (Table 2⇑; Sun vs. Shade+1). Observed differences in berry composition between Sun and Shade+1 clusters are considered to be related to the combined effects of solar radiation and exposure to high temperatures. Berries on Shade and Sun-1 clusters accumulated the same amount of thermal time, had similar mean and maximum berry temperatures, and the same duration of exposure to temperatures above thresholds between 15 and 40°C (Table 2⇑; HR>15, HR>20, and HR>25 data not shown). Observed differences in berry composition between these treatments are considered to be related directly to differences in solar radiation. Compared to their ambient counterparts on the east aspect of the canopy (Sun), berries on West-Sun clusters accumulated ≈5% less thermal time, had slightly lower mean (−0.5°C) but higher maximum temperatures (+4°C), and were exposed to fewer hours above temperature thresholds from 15 to 25°C but more hours above temperature thresholds from 35 to 40°C (Table 2⇑; Sun vs. West-Sun; HR>15, HR>20, HR>25 data not shown). Because Sun clusters were exposed to approximately the same total irradiance as West-Sun clusters, differences in berry composition observed between Sun and West-Sun are considered to be related to differences in high temperature extremes. The temperature-control regimens of this study are unique in that they were dynamic—paralleling the actual diurnal fluctuation of temperature in the vineyard. The temperature of only the treated clusters was manipulated, not that of the entire plant. This design allowed us to infer an effect of temperature on berry composition independently of any confounding effects of canopy and root temperature. Temperatures were controlled for the duration of ripening, which is characteristic of a production vineyard in which a canopy-management technique is applied before veraison and remains effective until harvest (e.g., leaf removal or raising foliage wires). In the present study, we achieved larger departures in berry temperature from ambient than in our previous work (Spayd et al. 2002). Elsewhere, in vitro studies under static laboratory temperatures have contributed to an understanding of potential temperature-induced gene expression and enzyme activity in detached grape berries (Mori et al. 2007). While some of the basic constructs of phenolic biochemistry may be elucidated from work conducted under constant temperatures in greenhouses or growth chambers (e.g., Mori et al. 2007, Yamane et al. 2006), those results can be expected to have only limited direct application in production vineyards, which are subjected to natural diurnal fluctuations in temperature. Furthermore, under the typically low illumination of controlled environments, it is difficult if not impossible to separate the interaction between solar radiation and temperature that occurs in the field. Berry composition: %SS, TA, pH. Berry mass was lowest and %SS highest in 2003 (Table 3⇓). During ripening, the rate of accumulation of thermal time was higher in 2003 (8.9 DD d−1) than in 2002 (8.3 DD d−1) or 2001 (8.2 DD d−1). Treatments had no influence on berry mass or %SS (data not shown). The influence of treatments on TA and pH was similar between years (Table 3⇓). Among sunlit clusters on the east aspect of the canopy, higher berry temperatures resulted in lower TA and higher pH (Sun-linear, p ≤ 0.0001). For example, berries from Sun-2 had an average TA of 7.6 g/L and pH of 3.58, and berries from Sun+2 had an average TA of 5.9 g/L and pH of 3.76. Berries from Sun clusters had higher TA (p < 0.027; 6.6 g/L) than berries from West-Sun clusters (5.9 g/L). Berry mass, percent soluble solids (%SS), titratable acidity (TA), pH, total skin anthocyanins (TSA), and total flavonol-glycosides of Merlot berries from three growing seasons. Berry composition: anthocyanins and flavonols. Total flavonol-glycosides were highest in 2001 (Table 3⇑) because of higher concentrations of quercetin 3-glucoside that year (data not shown). The response to treatments of individual and total flavonol-glycoside concentrations was similar among years. In agreement with our previous results (Spayd et al. 2002), berries from clusters exposed to direct solar radiation had higher (more than double) flavonol-glycoside concentrations than berries from shaded clusters (i.e., Sun vs. Shade+1; Table 4⇓). At temperatures identical to those of shaded fruit (Shade vs. Sun-1), exposure to more intense solar radiation increased concentrations of quercetin 3-glucoside but had no apparent influence on concentrations of kaempferol 3-glucoside, the reason for which is unclear. Among clusters exposed to direct solar radiation, there was no apparent relationship between cluster temperature and flavonol-glycoside concentration. Concentrations of flavonol-glycosides were lower than previously reported (Spayd et al. 2002). 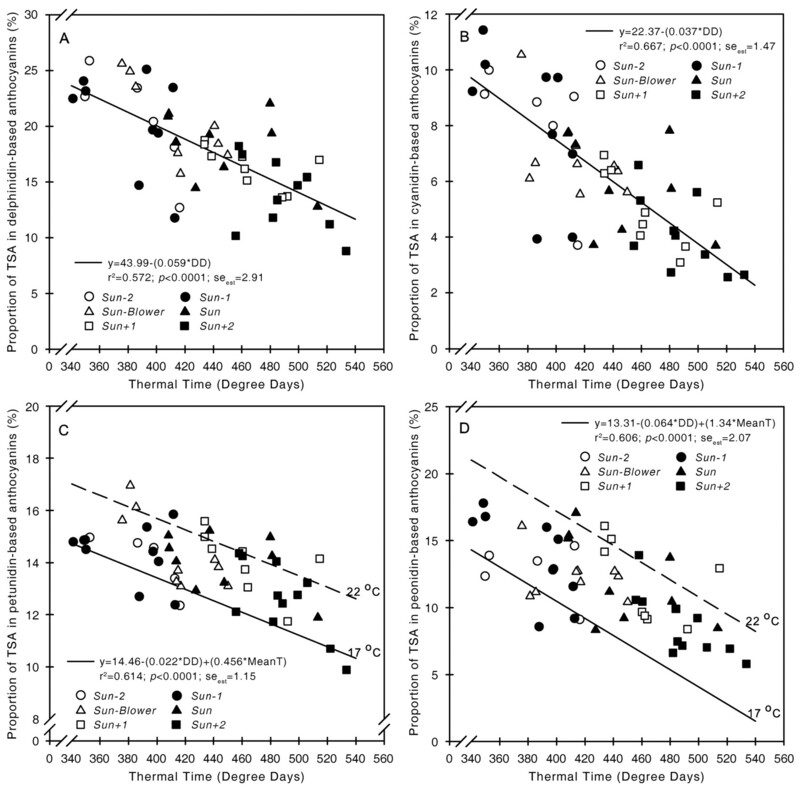 Mean values of individual and total flavonol-glycoside concentrations in berry skins from Merlot across three seasons for 10 temperature-solar radiation regimens. Anthocyanin identification and overall TSA. Fifteen individual anthocyanins were identified in the Merlot berry skins: glucosides of delphinidin, cyanidin, petunidin, peonidin, and malvidin, and the acylated (acetic or coumaric acids) forms of these five base compounds (Table 5⇓). Malvidin 3-glucoside was the most prevalent anthocyanin and malvidin 3-acetyl-glucoside was the major acylated anthocyanin in all treatments. Berries had the lowest TSA in 2002 (Table 3⇑), which was reflected in lower concentrations of most acylated and nonacylated anthocyanins (data not shown). The influence of treatment on TSA and individual anthocyanin concentrations was similar between years. All anthocyanin values were substantially lower than those reported earlier (Spayd et al. 2002), possibly reflecting differences in season, HPLC conditions, and the external standard that was used for analyses. Individual and total skin anthocyanin (TSA) concentrations from Merlot berry skins across three seasons for 10 temperature-solar radiation regimens. Among clusters exposed to direct solar radiation on the east aspect of the canopy (e.g., Sun-2, Sun-1, Sun, Sun+1, Sun+2), TSA decreased as berry temperature increased (Table 5⇑). With increasing berry temperature, total concentrations of delphinidin, cyanidin, petunidin, and peonidin-based anthocyanins decreased, whereas the total concentration of malvidin-based anthocyanins as a group was unaffected. Higher berry temperatures had no influence on concentrations of malvidin 3-glucoside but resulted in higher concentrations of its acylated forms: malvidin 3-coumaroyl-glucoside and malvidin 3-acetyl-glucoside. By comparison, concentrations of all but one of the other acylated anthocyanins decreased as berry temperature increased. We observed similar trends in anthocyanin concentration as a function of temperature among shaded clusters, where higher berry temperature was associated with lower TSA accumulation (Table 5⇑; Shade vs. Shade+1) due to lower concentrations of all five nonacylated anthocyanins and four of the acetic acid acylated anthocyanins. Berry temperature did not appear to influence the concentration of malvidin 3-acetyl-glucoside in shaded fruit, but as berry temperature increased so did the concentration of malvidin 3-coumaroyl-glucoside. It was recently proposed that temperature does not affect the accumulation of malvidin 3-glucoside in Merlot (Pereira et al. 2006) or in Pinot noir (Cortell et al. 2007), a cultivar that produces only nonacylated anthocyanins. Cabernet Sauvignon and Syrah grape anthocyanin profiles are similar to those reported for Merlot grapes, although the relative proportions of the individual anthocyanins were slightly different (Ortega-Regules et al. 2006). Our data indicate that anthocyanin accumulation is more complex than was described previously (Ristic et al. 2007, Cortell et al. 2007, Pereira et al. 2006, Downey et al. 2004). Under heavy natural shading by the canopy, higher berry temperature led to lower malvidin 3-glucoside accumulation (Table 5⇑; Shade vs. Shade+1), whereas under exposure to direct solar radiation, berry temperature had no influence on the concentration of malvidin 3-glucoside, yet only for fruit on the east aspect of the canopy. In general berries from sunlit clusters on the west aspect of the canopy (West-Sun) had lower concentrations of malvidin 3-glucoside, lower TSA, and lower concentrations of nearly all individual anthocyanins than all sunlit fruit on the east aspect of the vine except Sun+2 berries. Anthocyanin concentrations at commercial maturity, particularly malvidin-based anthocyanins, may represent the outcome of a complex interaction between irradiance and high temperature extremes. 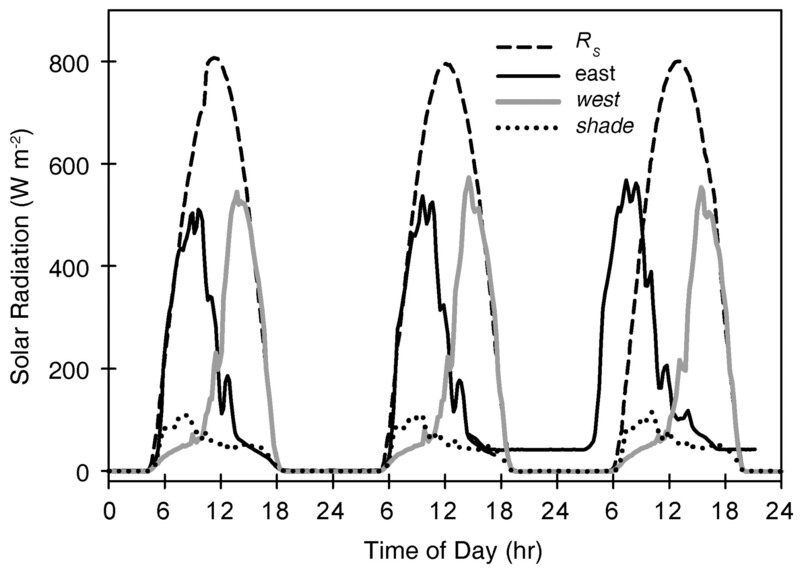 Because of row orientation, West-Sun and all sunlit clusters on the east aspect of the canopy were exposed to approximately the same total irradiance each day (Figure 1⇑). Mean berry temperature was lower in West-Sun clusters than in Sun clusters (Table 5⇑) and West-Sun berries accumulated less thermal time (by 4 to 15%) than all sunlit clusters on the east aspect of the canopy (Table 2⇑). A potentially critical distinction among sun-exposed treatments lies in exposure to high temperature extremes: berries on West-Sun clusters were subjected to temperatures above 35°C for an average of 89 hr during ripening, or three times the duration of exposure for berries on Sun clusters. Likewise, berries on West-Sun clusters were subjected to temperatures above 40°C more than five times longer (26 hr) than were berries on Sun clusters (5 hr). Berries on Sun+2 clusters, the warmest fruit with an east aspect, were above 35°C for about the same duration (84 hr) as West-Sun berries, but were above 40°C for less than half the duration of West-Sun berries (10 hr). In berries exposed to similar intensity of and similar cumulative exposure to solar radiation in the field, anthocyanin accumulation appears to respond negatively to high temperature extremes that may involve only short periods during ripening. Grouping by anthocyanidin, acylation, and B-ring substitution. In addition to absolute concentrations, it is useful to express anthocyanin composition in relative terms. As sunlit berries (east aspect) accumulated more thermal time, the proportion of TSA comprised by delphinidin, cyanidin, petunidin, and peonidin aglycones decreased linearly (Figure 2A–D⇓) and the proportion comprised by the malvidin aglycone increased linearly (Figure 3⇓). For a given accumulation of thermal time, an increase in mean berry temperature could be expected to increase the proportions of peonidin and petunidin-based anthocyanins as groups and to decrease the proportion of TSA comprised by malvidin-based anthocyanins as a group. Model inputs of 17 and 22°C were used to represent the range of mean berry temperatures observed during this study. Relationship between temperature from veraison until harvest and proportion of total anthocyanin as (A) delphinidin, (B) cyanidin, (C) petunidin, and (D) peonidin-based anthocyanins in berry skins from Merlot clusters in full sun. Thermal time is expressed in degree days (DD; base 10°C). MeanT refers to mean berry temperature from the first visible sign of veraison to harvest. Description of treatments in Table 2⇑. Regressions based on data over three growing seasons (n = 55). Relationship between temperature from veraison until harvest and proportion of total anthocyanin as malvidin-based anthocyanins in berry skins from Merlot clusters in full sun. Thermal time expressed in degree days (DD; base 10°C). MeanT refers to the mean berry temperature from the first visible sign of veraison to harvest. Description of treatments in Table 2⇑. Regressions based on data over three growing seasons (n = 55). Differences among treatments in concentrations of acylated anthocyanins as a group generally were small (Table 6⇓; p > 0.05). Nonetheless, concentrations of acylated anthocyanins as a group increased under shade (i.e., Shade vs. Sun-1; p = 0.004) and decreased under high temperature extremes (i.e., Sun vs. West-Sun; p = 0.005). Overall, as cluster temperature increased in both shaded and sunlit fruit, acylated anthocyanins represented an increasing proportion of TSA (Figure 4A⇓). That was the case both for acylation with acetic acid and with coumaric acid (Table 6⇓). Acylated anthocyanins are known to be more stable than their nonacylated counterparts (Rodriguez-Sanoa et al. 1999), but what is not well understood is the controlling mechanism for the balance between the pool of nonacylated anthocyanins and subsequent acylation with acetic or coumaric acids (Nakayama et al. 2003, Springob et al. 2003). Berry temperature may influence aliphatic and aromatic acyltransferases, the enzymes responsible for the acylation step of the biosynthetic pathway. It is possible that grape berries shunt more of the available anthocyanin toward acylation in response to temperature stress, with the potential advantage to the plant of color stability within the vacuole because of the stability of the acylated compounds. While these conjectures require further examination by isolation of these enzymes and their regulatory genes, such investigation is not within the scope of the present study. Total skin anthocyanin (TSA) concentrations and proportion of total anthocyanins (italics) grouped by anthocyanidin, acylation, and branch of the phenylpropanoid biosynthetic pathway in berry skins from Merlot across three seasons for 10 temperature-solar radiation regimens. Relationship between temperature from veraison until harvest and proportion of total anthocyanin as (A) acylated and (B) trihydroxylated anthocyanins in berry skins from Merlot clusters in full sun. Thermal time is expressed in degree days (DD; base 10°C). MeanT refers to mean berry temperature from the first visible sign of veraison to harvest. Description of treatments in-sons (n = 55). Acylated anthocyanins refer to the five base anthocyanins (delphinidin, cyanidin, petunidin, peonidin, malvidin 3-glucosides) acylated with acetic or coumaric acids. Trihydroxylated anthocyanins are those derived from delphinidin, petunidin, and malvidin. Parallel branches in the phenylpropanoid biosynthetic pathway lead to the production of cyanidin (downstream of flavonoid-3′-hydroxylase-regulated steps) or delphinidin (downstream of flavonoid-3′,5′-hydroxylase-regulated steps; Castellarin et al. 2007). Grouped thus by B-ring substitution, in both sunlit and shaded fruit, with higher berry temperature there was a trend toward lower absolute concentration and lower proportion of TSA comprised by dihydroxylated anthocyanins (cyanidin and peonidin-derived). The proportion of TSA comprised of trihydroxylated anthocyanins (delphinidin, petunidin, and malvidin-derived) increased (Table 6⇑; Shade vs. Shade+1, Sun-linear; Figure 4B⇑), but there was a general tendency for absolute concentrations of the trihydroxylated anthocyanins as a group to decrease with increasing berry temperature in fruit exposed to direct solar radiation. The response of the trihydroxylated group was driven by an increase in the malvidin aglycone as a proportion of TSA, reflected in higher concentrations of the acylated derivatives. The proportion of the trihydroxylated group comprised by delphinidin and petunidin-derived anthocyanins decreased as berry temperature increased in both sunlit and shaded fruit (Table 6⇑; Shade vs. Shade+1, Sun-linear). Interactions between temperature and solar radiation. At berry temperatures equal to those of shaded fruit (Shade, Sun-1), exposure to direct solar radiation decreased concentrations of the acylated anthocyanins peonidin 3-acetyl glucoside (p < 0.001), malvidin 3-acetyl glucoside (p < 0.0001), and cyanidin 3-coumaroyl glucoside (p < 0.001). Exposure to direct solar radiation also decreased the proportion of TSA comprised by acylated anthocyanins and increased the proportion of TSA comprised by dihydroxylated anthocyanins (Table 6⇑; Shade vs. Sun-1). This observed effect on the relative proportions of acylated and nonacylated anthocyanins was manifested by increased concentrations of peonidin and malvidin 3-acetyl-glucosides, and decreased concentrations of cyanidin 3-glucoside in berries from the Sun-1 clusters (Table 5⇑; Shade vs. Sun-1). In this fruit that was isothermal with ambient air, shade appeared to have no influence on TSA or the proportion of TSA in malvidin-based anthocyanins. Given that shaded clusters in this study were subjected to an average of only 12% of incident irradiance, there may be an extremely low threshold value for radiation-induced effects on TSA and malvidin-based anthocyanins. At both the mean berry temperature and accumulated thermal time represented by ambient sun-exposed fruit (i.e., Shade+1 vs. Sun), exposure to direct solar radiation increased the proportion of TSA from dihydroxylated anthocyanins and decreased the proportion from trihydroxylated anthocyanins (Table 6⇑). Absolute concentrations of dihydroxylated anthocyanins were lower in the shaded berries (p < 0.003). Berries from Shade+1 clusters had lower TSA, a higher proportion of TSA comprised of malvidin-based anthocyanins, and a higher proportion of TSA comprised of acylated anthocyanins than berries from Sun clusters (Table 5⇑, Table 6⇑). In addition to much lower incident radiation, berries from Shade+1 clusters were exposed to lower temperature maxima and shorter exposure to temperatures above 35 to 40°C than were berries from Sun clusters (Table 2⇑), indicating a complex combined effect of solar radiation and high temperature extremes on anthocyanin composition. The West-Sun clusters provide further support for this complex interaction: these berries tended to have the lowest concentration of dihydroxylated anthocyanins and a lower proportion of TSA comprised by this group than nearly all other fruit. Berry temperature may influence the activity of flavonoid-3′,5′-hydroxylase and flavonoid-3′-hydroxylase rather than absence of light alone as previously speculated (Downey et al. 2004). It may be most useful to think of solar radiation and temperature imposing synergistic effects on anthocyanin development, within metabolic limits. Low incident solar radiation alone appeared not to compromise total anthocyanin accumulation during this study, which also was observed in Shiraz clusters enclosed in opaque boxes (Ristic et al. 2007, Downey et al. 2004). Instead it appears that a combination of low light and high berry temperatures decreased TSA (i.e., Shade vs. Shade+1, Shade vs. Sun-1, Shade+1 vs. Sun). Berries from shaded clusters that were heated (Shade+1) produced lower TSA than any fruit on the east aspect of the canopy except those that were at the highest temperatures (Sun+2). At the temperature of ambient air, berries from Shade clusters produced equal or higher TSA than any of the sunlit clusters, indicating the potential role of moderate daytime temperatures in maximizing anthocyanin accumulation. Although not included in a priori contrast analysis, the berries on Shade clusters were exposed both to lower mean daytime temperatures during ripening and fewer extreme temperatures (e.g., 5 hr >35°C) than sunlit fruit (e.g., 37 to 89 hr >35°C) with the exception of Sun-1 (5 hr >35°C) and Sun-2 (5 hr >35°C). The moderated temperatures of Sun-2 berries appeared to lead to higher TSA than in Sun berries, higher concentrations of the aglycones delphinidin, cyanidin, petunidin, and peonidin, and lower concentrations of malvidin-based anthocyanins as a group. These trends also were observed in Shade clusters. Analogous responses to temperature were observed in excised Cabernet Sauvignon berries (Mori et al. 2007). Temperature, particularly daytime temperature during ripening, appeared to be an overriding environmental determinant of anthocyanin development in Merlot under the field conditions encountered in this study. Temperature control of the experimental clusters was based on untreated ambient sunlit and shaded fruit, but the temperatures encountered may have exceeded optimum for maximum anthocyanin accumulation. Hence the lower anthocyanin concentratons with higher temperatures, regardless of exposure to solar radiation. Ideal conditions for anthocyanin accumulation in grapes are not known and it has not yet been established whether anthocyanin accumulation is due to an integrated response to temperature as conveyed by the concept of thermal time, to specific threshold temperatures, or to a duration of exposure to critical temperatures. Likewise, the critical stage of development for a response to temperature has not been established, although an in vitro study indicated that a key period might be the fortnight following the first visual indicator of veraison (Yamane et al. 2006). Within the range of temperatures measured during this study, cluster temperature appears to be the limiting factor for anthocyanin concentration at commercial maturity and a principal determinant of the proportion of TSA comprised by any of the five observed aglycones. Exposure to direct solar radiation appears to promote dihydroxylation of the B-ring and result in less accumulation of the acylated derivatives of all five anthocyanidins. Anthocyanin accumulation and the anthocyanin profile in Merlot berries appear to be determined by a synergistic combination of solar radiation and berry temperature, which is more complex than previously reported. Our data indicate that temperature is a strong environmental determinant of anthocyanin profile in the berry skins, above a potentially low threshold of exposure to solar radiation. What is not known from this study is whether suboptimal vineyard microclimate, particularly berry temperature, inhibits, degrades, and/or alters the anthocyanin molecule. Manipulating vineyard conditions to alter the anthocyanin profile of the berry may become a useful approach to strategic management as we better understand the contribution of individual anthocyanins to final fruit and wine quality. Further investigation also would be warranted for more detailed analyses of flavonol-glycosides, flavanol monomers, and flavanol polymers as functions of cluster temperature. Acknowledgments: This work was funded by USDA-ARS CRIS no. 5358-21000-034-D and by Washington State University. Mention of a trademark, proprietary product, or vendor does not constitute a guarantee or warranty of the product by the U.S. Department of Agriculture and does not imply its approval to the exclusion of other products or vendors that also may be suitable. The authors thank John Ferguson, Maria Mireles, and Barbara Zimmerman for technical support and James Harbertson for helpful comments. Castellarin, S.D., A. Pfeiffer, P. Silviotti, M. Degan, E. Peterlunger, and G. Di Gaspero. 2007. Transcriptional regulation of anthocyanin biosynthesis in ripening fruits of grapevine under seasonal water deficit. Plant Cell Environ. 30:1381–1399. Chalker-Scott, L. 1999. Environmental significance of anthocyanins in plant stress responses. Photochem. Photobiol. 70:1–9. Cheynier, V. 2005. Polyphenols in foods are more complex than often thought. Am. J. Clin. Nutr. 81:223S–229S. Cortell, J.M., M. Halbleib, A.V. Galagher, T.L. Righetti, and J.A. Kennedy. 2007. Influence of vine vigor on grape (Vitis vinifera L. cv. Pinot noir) anthocyanins. 1. Anthocyanin concentration and composition in fruit. J. Agric. Food Chem. 55:6575–6584. Downey, M.O., J.S. Harvey, and S.P. Robinson. 2004. The effect of bunch shading on berry development and flavonoid accumulation in Shiraz grapes. Aust. J. Grape Wine Res. 10:55–73. Gould, K.S., and C. Lister. 2006. Flavonoid function in plants. In Flavonoids: Chemistry, Biochemistry and Applications. O.M. Andersen and K.R. Markham (Eds. ), pp. 397–441. CRC Press, Boca Raton, FL. Haselgrove, L., D. Botting, R. van Heeswijch, P.B. Høj, P.R. Dry, C. Ford, and P.G. Iland. 2000. Canopy microclimate and berry composition: The effect of bunch exposure on the phenolic composition of Vitis vinifera L. cv. Shiraz grape berries. Aust. J. Grape Wine Res. 6:141–149. Mori, K., S. Sugaya, and H. Gemma. 2005a. Decreased anthocyanin biosynthesis in grape berries grown under elevated night temperature condition. Sci. Hortic. 105:319–330. Mori, K., H. Saito, N. Goto-Yamamoto, M. Kitayama, S. Kobayashi, S. Sugaya, H. Gemma, and K. Hashizume. 2005b. Effects of abscisic acid treatment and night temperatures on anthocyanin composition in Pinot noir grapes. Vitis 44:161–165. Mori, K., N. Goto-Yamamoto, M. Kitayama, and K. Hashizume. 2007. Loss of anthocyanins in red-wine grape under high temperature. J. Exp. Bot. 58:1935–1945. Nakayama, T., H. Suzuki, and T. Nishino. 2003. Anthocyanin acyltransferases: Specificities, mechanism, phylogenetics, and applications. J. Mol. Cat. B. 23:117–132. Ortega-Regules, A., I. Romero-Cascales, J.M. Lopez-Roca, J.M. Ros-Garcia, and E. Gomez-Plaza. 2006. Anthocyanin fingerprint of grapes: Environmental and genetic variations. J. Sci. Food Agric. 86:1460–1467. Pereira, G.E., J.P. Gaudillere, P. Pieri, G. Hilbert, M. Maucourt, C. Deborde, A. Moing, and D. Rolin. 2006. Microclimate influence on mineral and metabolic profiles of grape berries. J. Agric. Food Chem. 54:6765–6775. Ristic, R., M.O. Downey, P.G. Iland, K. Bindon, I.L. Francis, M. Herderich, and S.P. Robinson. 2007. Exclusion of sunlight from Shiraz grapes alters wine colour, tannin and sensory properties. Aust. J. Grape Wine Res. 13:53–65. Robinson, S.P., and C. Davies. 2000. Molecular biology of grape berry ripening. Aust. J. Grape Wine Res. 6:175–188. Rodriguez-Sanoa, L.E., M.M. Giusti, and R.E. Wrolstad. 1999. Color and pigment stability of red radish and red-fleshed potato anthocyanins in juice model systems. J. Food Sci. 64:451–456. Spayd, S.E., J.M. Tarara, D.L. Mee, and J.C. Ferguson. 2002. Separation of sunlight and temperature effects on the composition of Vitis vinifera cv. Merlot berries. Am. J. Enol. Vitic. 53:171–182. Springob, K., J. Nakajima, M. Yamazaki, and K. Saito. 2003. Recent advances in the biosynthesis and accumulation of anthocyanins. Nat. Prod. Rep. 20:288–303. Tarara, J.M., J.C. Ferguson, and S.E. Spayd. 2000. A chamber-free method of heating and cooling grape clusters in the vineyard. Am. J. Enol. Vitic. 51:182–188. Tobin, P.C., S. Nagarkatti, and M.C. Saunders. 2001. Modeling development in grape berry moth (Lepidoptera: Tortricidae). Environ. Entomol. 30:692–699. Ubi, B.E., C. Honda, H. Bessho, S. Kondo, M. Wada, S. Kobayashi, and T. Moriguchi. 2006. Expression of analysis of anthocyanin biosynthetic genes in apple skin: Effect of UV-B and temperature. Plant Sci. 170:571–578. Winkel-Shirley, B. 2002. Biosynthesis of flavonoids and effects of stress. Curr. Opin. Plant Biol. 5:218–223. Yamane, T., S.T. Jeong, N. Goto-Yamamoto, Y. Koshita, and S. Kobayashi. 2006. Effects of temperature on anthocyanin biosynthesis in grape berry skins. Am. J. Enol. Vitic. 57:54–59.